The London high-streets are bustling with tourists enjoying the English summer. 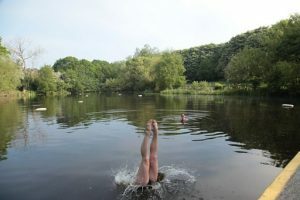 Kaffe and I have been starting our day early with a quick swim in the Hampstead Heath ponds. A treat to behold. Natural spring water surrounded by mature trees casting the dappled light of an English sunrise shining on a stunning heron that inhabits the pond. Rosie Holman, who heads our social media, has been feeding our social media outlets on the Facebook pages and Instagram. Laura Queening, our studio assistant has been painstakingly archiving the mountain of design work we have built up over the years, all of which gets used constantly for promotions. Following on from the success of the exhibition we had at the National Trust property Standen House, Kaffe has been invited to exhibit in 5 rooms of another great house, Mottisfont Abbey. He has chosen 5 different colours and we have carefully selected 70 pieces of work, which will come together to create colour themed rooms. The exhibition will run from 16th September 2017 to 14th January 2018. Visit Mottisfont’s website for more information. Kaffe’s latest publication, Sew Artisan, has been received well by many of you so far and we have been enjoying seeing the results of people’s projects. The book features inspirational sewing and patchwork patterns and is available to download as an eBook. Alternatively, you can order your own paperback copy via our website. 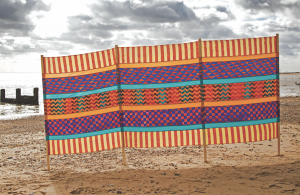 We are also delighted to be launching some new colourways for our Artisan fabric range. Look out for the red and pastel colours in shops from August. As for the Kaffe Fassett Collective fabrics, you can look forward to seeing new designs from Kaffe and new colourways from Philip Jacobs and I this Autumn. 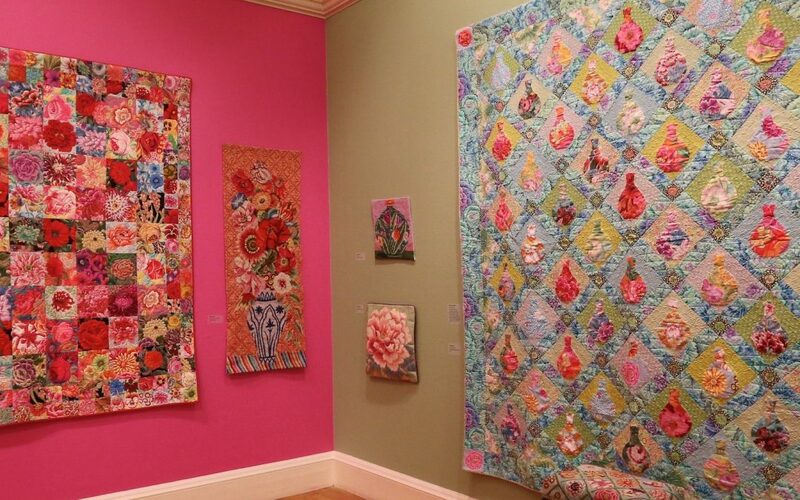 In mid August we will be joining other fellow designers at the Festival Of Quilts, NEC, Birmingham, along with the talented designer Anna Maria Horner, who will be travelling from her home town of Nashville, Tennessee to be at the Festival on the Rhinetex stand. 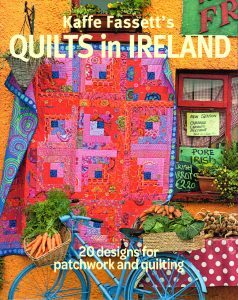 Kaffe and I will be signing pre-released copies of the brand new P&Q book ‘Quilts In Ireland’ on the Rhinetex, Cotton Patch and Lady Sew & Sew stands at scheduled times from Thursday 10th to Saturday 12th August. Kaffe, myself and our loyal photographer friend Debbie Patterson spent a week last September weaving our way through the back lanes and small towns of County Cork, Ireland looking for locations to photograph the latest collection of quilts. At the end of August we will be at the Rhinetex Headquarters in Holland to host a series of short talks and workshops. We then go to Stoffekontor, a shop in Leipzig, Germany and Quilt Palace, Amsterdam to host a workshop and slide lecture. If you can made it, do join us as it will be a visual extravaganza for sure. I’m proud to be able to share with you the beautiful new, ready-to-wear fine knits Kaffe has done for Peruvian Connection. These garments are available to mail order or though their boutique shops such as Kings Road in London, Boston, Chicago, San Francisco and online. 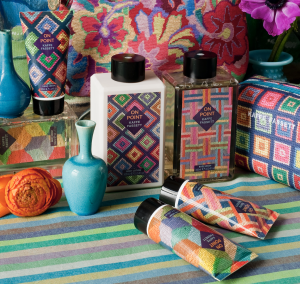 The news on Kaffe’s fragrance range is that Ulta stores in the US are no longer carrying the range, though both the Achillea range and the On Point range are very much still available either through www.kaffefassettfragrance.com or discerning boutique shops. If you are interested in carrying stock of the range, visit the website for more details. 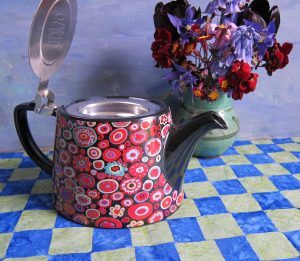 The London Pottery Company, who has put images of Kaffe’s fabrics on a new teapot range they have produced, will soon be ready for shops to place their orders and carry stock. You can see more info on their website. Kaffe is stitching a new needlepoint kit for Ehrman Tapestry consisting of two 2’ x 5’ needlepoint panels and he is in his element. Hugh Ehrman asked Kaffe if he’d like to do a large panel as a kit and he’s done nothing else for days. We hope to have the panels in the exhibition Kaffe is having with mosaic artist Candace Bahouth next May at the Victoria Gallery, Bath England. The exhibition carries on where his popular book ‘Bold Blooms’ leaves off. 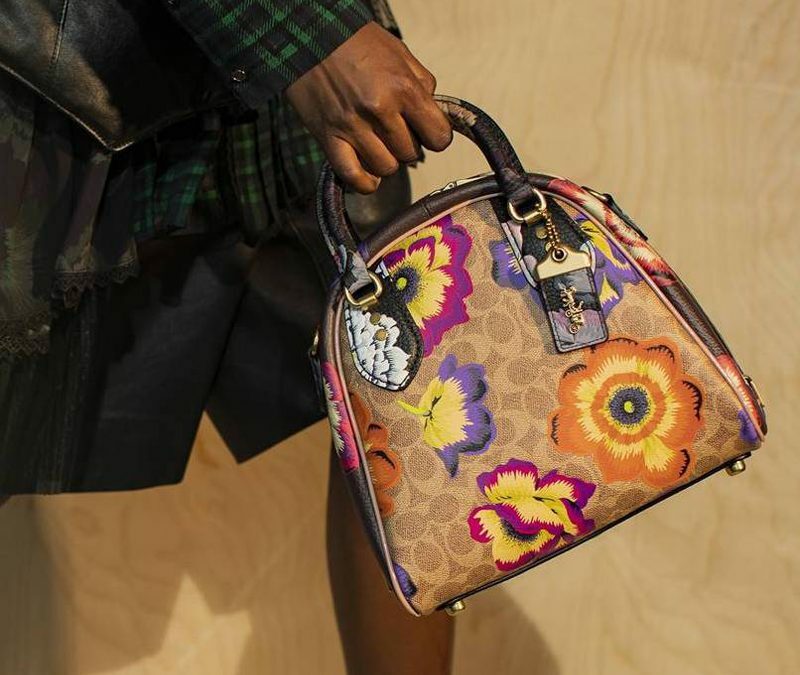 It celebrates bold flowers in needlepoint, patchwork, mosaic and painting and will run for 6 months. Renaissance Ribbons who stock a range of truly exquisite ribbon including many with Kaffe’s designs, have created a new Ribbon Club. 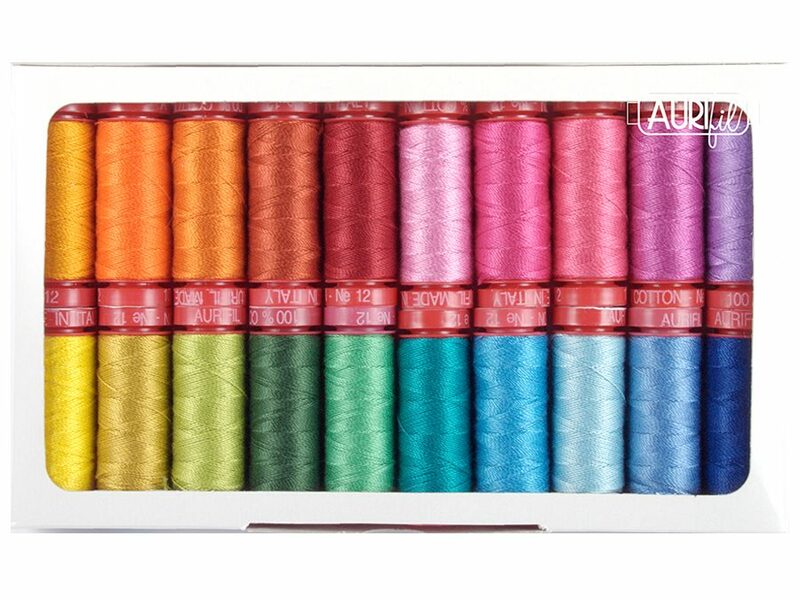 If you join the club you can receive monthly shipments of ribbon for all your creative sewing projects. Take a look at their website for more info. Our diary is packed with promotional dates with workshops and lectures for the next 8 months. We are starting a major workshop tour of North America in the 15th September in Seattle. The tour ends on the 6th November when we will be very happy to see our own beds. Check our events page on our website and hope to catch up with you all where we can. Sending you all good thoughts and look forward to next time.